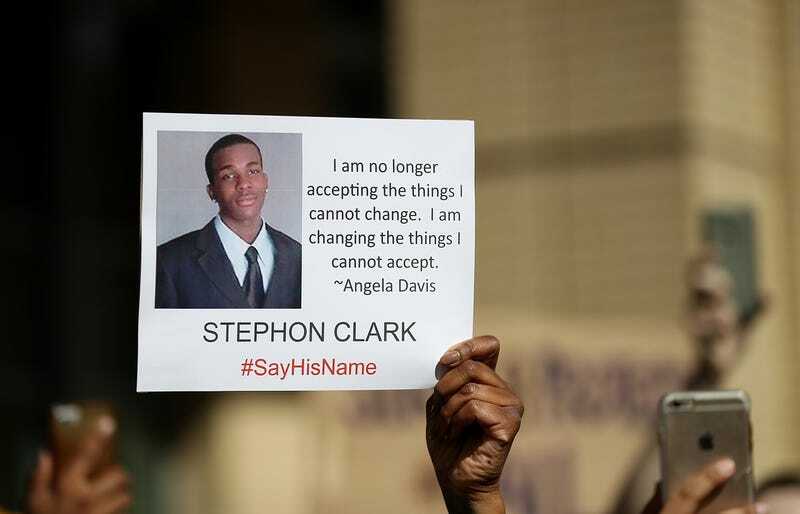 A protester holds a photo of Stephon Clark during a Black Lives Matter demonstration outside of Sacramento City Hall on March 22, 2018 in Sacramento, California. Just days after the Sacramento Police Department alerted the media that their investigation into the officer-involved shooting death of 22-year-old Stephon Clark had been completed and handed off to both the state attorney general and the county district attorney, DA Anne Marie Schubert’s office said in a release that their review of that investigation could take 90 days or more. “After reviewing these materials, we may determine that additional investigation or information is needed. Our review process may be delayed, depending on the circumstances. We will take whatever time is necessary to complete that process, as we balance our desire to complete this investigation review in a timely manner with the overarching need to ensure any conclusions we reach are the result of a thorough and methodical evaluation of the facts and the law,” the statement said. TL;DR: We are going to drag our feet on this. The statement then clarified the district attorney’s office goal in reviewing the investigation. The DA’s office is not here to determine whether or not the officers were right to shoot Stephon Clark dead for holding a cell phone. The DA’s office is here to determine whether those officers should face criminal charges for shooting and killing him for holding a cell phone. Officers Terrence Mercadal and Jared Robinet fired a total of 20 shots at Clark as he stood on the patio in his grandmother’s backyard on March 18. They had been in pursuit of him because he allegedly broke car windows in the neighborhood—a vandalism charge that would not warrant the death penalty in any court of law. At least seven of those shots hit Clark, mostly in the back, killing him. The police department still has not even officially identified the officers; their names are only known because an Oakland civil rights attorney revealed them to the media. I guess we won’t sit around holding our collective breath.